I have heard Twentieth Century sometimes referred to as the first screwball comedy. Whether it technically was or not, this flick and its leading lady certainly embody what we have come to associate with the genre. Carole Lombard would reign in such nonsensical films, which make up what I consider the best of her work. 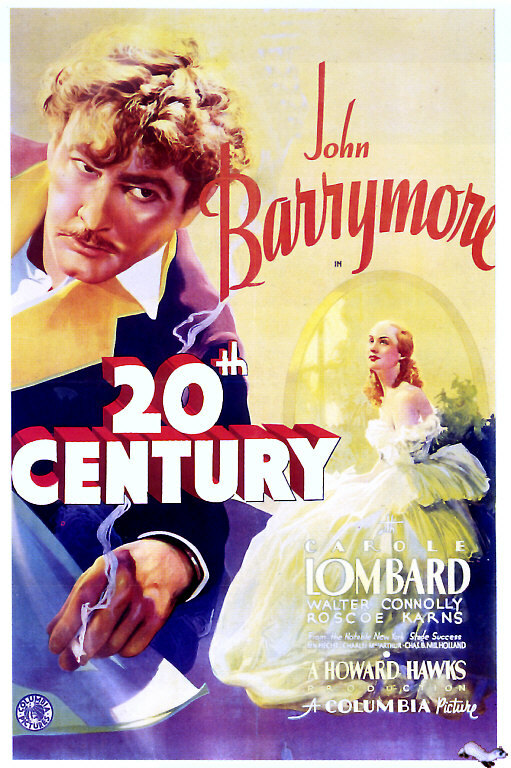 In this “movie about a train”, as I like to call it, Lombard and John Barrymore are theater actors/director who spend nearly the entire picture making scenes by being as dramatic as any role they might have the chance to play. The latter half of the movie takes place in the small confines of a train, the Twentieth Century. John Barrymore plays Oscar Jaffe, a Broadway director, who takes an unknown Mildred Plotka and turns her into the star Lily Garland (Lombard). Our first encounter with the characters has Jaffe fighting to keep his discovery in the play while battling to get her to perform correctly. He uses chalk to draw the movements she should take during a scene to the point that an undiscernable amount of lines mark the stage floor. He also elicits an appropriate scream from her for one scene by sticking the lady’s rear end with a pin. Lily becomes a hit, however, and on opening night Jaffe showers her with praise and speaks of how above him she is now until the woman begs for his companionship, as was his plan. When next we see the couple, Lily is refusing to accept Jaffe’s calls and is throwing a fit in her lavish New York apartment while telling Jaffe press agent Owen O’Malley (Roscoe Karns) she wants to end her relationship with the man. When Jaffe arrives at the home, he solemnly swears he will kill himself by jumping from the window, but the couple reconciles when Jaffe swears not to be possessive. After two more successful plays together, Lily finally dumps the director when she discovers he has been tapping her phone line and has hired a P.I. to follow her around. Without the actress who has gone to Hollywood, Jaffe’s stage success falters. He is escaping a failing show and its related debt in Chicago when he boards the Twentieth Century back to New York. At a stop along the way, Lily also boards, with her beau (Ralph Forbes), and unknowingly takes the room beside Jaffe’s. The two are outwardly livid as they learn of each other’s presence and put on big shows of distress. Jaffe plots to lure Lily back to his theater by offering her the role of Mary Magdalene in the passion play. Jaffe wants to make the show and is certain he could gain financing with Lily’s name on a contract, but she is not so easily won over. The movie closes on Jaffe drawing chalk lines on a stage dictating Lily’s movements. Lombard and Barrymore play their characters so melodramatically that rarely are we able to glimpse Lily and Jaffe’s true nature beneath the dramatic shows they put on for all around them. Lily mourns saying farewell to her boyfriend before becoming instantly annoyed when he refuses to leave and instead travels with her. Lily and Jaffe have no redeeming qualities but we cannot help but love them. Both are too selfish for us to want either to get his or her way, but the ending perhaps gives them what they deserve: each other.